The 1950s were, as author Charles Hyde aptly put it, a roller-coaster ride for Chrysler. The beginning of the decade had been rough: all of Chrysler’s brands lost market share at an alarming pace, thanks in large part to stodgy, dated styling. Finally, in late 1952, company president K.T. Keller authorized Virgil Exner, then the head of Chrysler’s small advanced styling studio, to dramatically redesign the company’s entire line-up. Chrysler spent $100 million on Exner’s “Forward Look” styling, which paid off with nearly doubled sales for 1955 and 1956. Emboldened, Exner called for another total redesign for 1957, with striking results. Added to the new “Torsionaire” torsion bar suspension and superb TorqueFlite automatic transmission, Chrysler had the hottest products in the domestic industry. The company should have been rolling in money by decade’s end, but all was not well in Highland Park. Chrysler recorded a $120 million profit for calendar year 1957, but labor and materials problems meant that many of the flashy ’57 cars were already falling apart before they even left the showroom floor. The facelifted 1958 models were better-built, but still suffered alarming corrosion and the problems of the ’57s had left buyers in a sour mood. When the Eisenhower recession hit that fall, sales sank sharply and Chrysler took a bath to the tune of $33.8 million — the equivalent of about a quarter of a billion dollars today. Losses for ’59 weren’t as bad, but still totaled $5.4 million. The hasty, last-minute downsizing of the 1962 Dodge Dart from its original, full-size dimensions was responsible for its awkward proportions, but not the hideous, warthog-like convex grille, which was created at the insistence of Dodge general manager M.C. Patterson. The outré side sculpting betrays these cars’ structural kinship with the compact Valiant. From the side, the contemporary Valiant looks very similar, despite riding a wheelbase almost 10 inches (25 cm) shorter — not surprising, since the big Dodge was essentially an expanded version of the Valiant body. Chrysler’s president in those days was Lester L. “Tex” Colbert, a former Dodge executive who had succeeded K.T. Keller in 1957. By 1960, Colbert was preparing to move from the presidency to the chairmanship of the Chrysler board. His chosen successor was the company’s executive vice president, William C. Newberg. In true old-boy’s-network fashion, Colbert and Newberg were close friends. They lived a few blocks apart in Detroit’s Bloomfield Hills suburb, they belonged to the same country club, and their wives were friends. Newberg had succeeded Colbert as head of Dodge in 1950 and when Colbert ascended to the presidency, Newberg became executive vice president. In due course, he was promoted to the corporate presidency on April 28, 1960. Not long after assuming his new office, Newberg attended a Detroit garden party where he overheard Chevrolet general manager Ed Cole discussing the new, small Chevy the division was planning to launch for the 1962 model year. Only six months earlier, Chevrolet — like Ford and Chrysler — had launched its first compact car, the Corvair. Now, Newberg thought they were going to follow suit by downsizing their full-size cars as well. 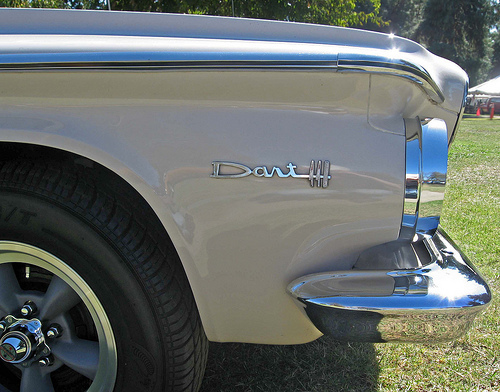 The 1962 Dodge Dart and its Plymouth siblings were 7.5 inches (190 mm) shorter than the ’61s while wheelbase shrank to 116 inches (2,946 mm). They retained unitary construction, but eliminated the front subframe of the 1960-61 models, which, combined with the smaller dimensions, trimmed around 350 pounds (159 kg) from their curb weight. Even a well-equipped convertible weighed only 3,400 pounds (1,542 kg), which benefited both fuel economy and performance, if not appearance. At the time, Newberg’s conclusion did not seem as outlandish as it may seem in retrospect. In the wake of the recession, American Motors’ Rambler line, most of which consisted of compact cars, had risen to fourth place in industry sales, nipping at Plymouth’s heels. (It would briefly displace Plymouth in the No. 3 spot for the 1961 model year.) Small imported cars had seen unprecedented sales growth, something that would have been almost unimaginable 10 years earlier. Meanwhile, Detroit had been regularly savaged by critics for allowing its bread-and-butter cars to get too big. Even some in the auto industry suspected that the dismal sales of 1958 had stemmed from public dissatisfaction with what George Romney had called “Detroit Dinosaurs.” The idea that Chevrolet might scale back for 1962 was not entirely far-fetched. In fact, the 1961 Chevrolet line, which appeared a few months later, wassmaller than before, albeit only by about 1.5 inches (38 mm) in overall length. What Newberg apparently didn’t grasp was that Cole was actually talking about the all-new Chevy II, a conventional, front-engine compact that was then being readied as an alternative to the rear-engine, air-cooled Corvair, whose sales had been disappointing. Others within Chrysler were probably aware of the Chevy II or could have found out easily enough — the Detroit auto industry is an insular world and unless a company makes a deliberate effort to keep a project secret, gossip spreads rapidly. Unfortunately, instead of investigating, Newberg ordered a crash program to make the 1962 Dodge and Plymouth lines smaller. By the time Newberg issued those orders, the design work on the 1962 models was basically complete and the cars were only a few months away from production. To redesign them in time for the start of production — only about a year away — the styling department had to go to double shifts, working around the clock to alter the dimensions of the previously approved designs. Those designs were not, in our view, Virgil Exner’s finest hour. After trumping GM in 1957, Exner seemed to be struggling for a new direction. His “S-series” designs took themes developed for the compact Valiant and expanded on them for the bigger cars. That was a curious decision; GM styling usually went in the opposite direction, introducing new concepts on Cadillacs and then filtering them down through the cheaper brands. 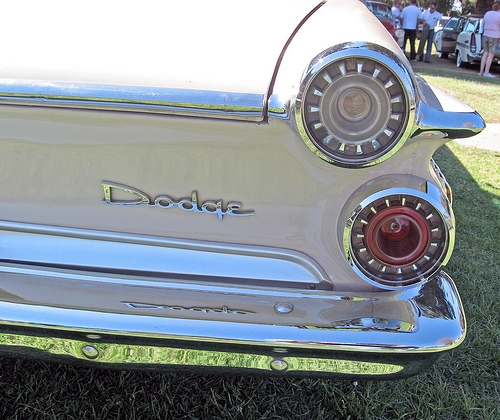 Even if the designs hadn’t been tampered with, the 1962 Dodge and Plymouth lines would have been odd-looking. As they emerged, they were aesthetic disasters. As outré as the 1962 Dodge’s nose may be, what was under the hood was not a problem. Six-cylinder Darts had Chrysler’s trusty Slant Six, while V8 models could have anything up to the fearsome 413 cu. in. (6,771 cc) “Max Wedge.” Performance was greatly improved, thanks to lighter weight. To save time and reduce costs, big 1962 Dodges and Plymouths were moved to a stretched version of the Valiant/Lancer compact shell. This had the effect of making the new cars considerably smaller than originally planned: Wheelbase was reduced from the planned 119 inches (3,023 mm) to 116 (2,946 mm); overall length shrank by 7.5 inches (190 mm); and width was reduced by about 4 inches (100 mm), with a less than felicitous effect on the cars’ proportions. To make matters worse, the engineering staff was standing over the stylists’ shoulders throughout the process looking for ways to cut production costs. This cost-cutting push led to the deletion, late in the development process, of various planned features, including curved side glass, wraparound bumpers, and an attractive new hardtop roofline. Exner, horrified, insisted that the results would be a commercial debacle and declared that his styling staff should not be held responsible. Curiously, to our knowledge, no one — other than Exner, whose protests fell on deaf ears — thought to question Newberg’s actions or, it appears, to even investigate the rumor that had provoked that decision. Indeed, many Chrysler executives had apparently convinced themselves that the downsized ’62s would be big hits. Even as this disaster was taking shape, a different crisis was brewing. At Chrysler’s annual shareholders meetings in 1959 and 1960, stockholder Solomon Dann accused Tex Colbert of mismanagement and charged that Chrysler executives were handing out contracts to suppliers in which those executives had a personal stake, driving up the company’s costs in order to line their own pockets. Those accusations prompted influential shareholder George Love, chairman of Consolidation Coal Company in Pittsburg, to recommend in April 1960 that the Chrysler board commission an independent audit. The audit, conducted by the accounting firm Touche, Ross & Co., discovered evidence that Bill Newberg and his wife Dorothy had interests in three different automotive suppliers whose Chrysler contracts had earned the Newbergs some $455,000. They were not the only Chrysler executives to profit in this way; Colbert later admitted that his wife Daisy had owned stock in a different Chrysler supplier, the Dura Corporation. With the stockholders already in an uproar and Sol Dann and his supporters threatening legal action — Dann and several other stockholders filed numerous lawsuits and later that year mounted an unsuccessful attempt to force Chrysler into receivership — the board realized something had to be done. On June 30, Newberg was fired after only 64 days as Chrysler’s president. At the same time, Colbert ordered other Chrysler executives to immediately divest themselves of any financial interests in Chrysler suppliers. Newberg complained loudly and publicly that he was just a scapegoat for a larger problem and alleged that Colbert had asked him to take the fall for the conflict-of-interest scandal, promising that Newberg would be taken care of financially. Newberg also claimed that Colbert had been well aware of the Newbergs’ outside interests and that Daisy Colbert had even asked Newberg if one of his companies could give the Colberts’ son a summer job. In January 1961, Newberg filed a $5.3 million unfair termination lawsuit against Chrysler, naming Colbert as a correspondent. Later that year, the two former friends had a chance encounter in a country club locker room, where Newberg allegedly punched Colbert in the face. Colbert denied Newberg’s allegations, but questions about Colbert’s own supplier interests remained, particularly after syndicated newspaper columnist Drew Pearson revealed that Colbert’s office safe contained $200,000 in bearer bonds whose source Colbert declined to reveal. Although Colbert continued to deny any wrongdoing, he stepped down as president in July 1961, accepting a new post as president of Chrysler Canada. He retired four years later at the age of 60. Newberg’s lawsuit was not resolved until 1970, when he and Chrysler agreed to settle out of court. The curious “kick-up” behind the 1962 Dodge’s front door was not intended for the hardtops, which were originally slated to have long side windows with no quarter lights, not unlike the 1970½ Camaro and Firebird. The hardtop was also intended to have a V-shaped backlight, similar to that of the 1967-70 Cadillac Eldorado. Both those features were eliminated at the last minute, as was the originally specified curved glass for the side windows. The flat glass melds awkwardly with the pronounced curvature of the body sides, which you can see if you look closely at the section just ahead of the chrome side spear. With Colbert’s departure, George Love, now chairman of the board, promoted administrative vice president Lynn Townsend as Chrysler’s new president. By then, the downsized 1962 Dodge and Plymouth, which Virgil Exner, Sr. had fatefully nicknamed “plucked chickens,” were just entering pilot production. The dealer introduction, which took place shortly after Townsend took office, went badly. 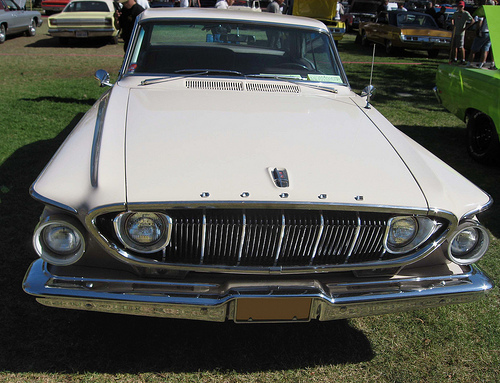 Dealers had not been particularly fond of Chrysler’s 1961 styling and were positively dismayed by the ’62s. The negativity was understandable; car salesmen and advertisers had been telling American consumers for years that bigger was better. Now, Dodge and Plymouth dealers were being asked to sell cars that were not only visibly smaller than the competition, but that also looked like overgrown, mutant versions of the compact Valiant. For all that, the ‘big’ 1962 Dodge and Plymouth still cost as much as a full-size Chevrolet or a Ford (and almost as much as a Pontiac Catalina), but were closer in size to Ford’s new mid-size Fairlane or GM’s Buick, Oldsmobile, and Pontiac “senior compacts.” It was not a recipe for commercial success. As the dealers stewed, Townsend embarked on a ruthless cost-cutting spree. Factories and offices were shuttered and around 7,000 white-collar employees were laid off. The cuts were painful, although they reduced Chrysler’s annual operating costs by more than $100 million. By the end of 1961, it was clear that the dealers’ reaction to the 1962 models had been prophetic. Sales of the big Plymouths were down 13% from the already-mediocre ’61 tally, falling from about 207,000 to fewer than 183,000. Dodge dropped from about 198,000 to around 159,000. At the same time, sales of Chevrolet’s big cars — which had not been downsized after all — soared to 1.4 million, almost 20% better than 1961. As you might imagine, a sales decline of almost 25% had Dodge dealers screaming for relief. Chrysler responded by cobbling together a new full-size Dodge, the 1962 Dodge Custom 880, which went on sale in February 1962. It was contrived by combining the body of the Chrysler Newport (which the big Dodge line had previously shared) with a lightly made-over front clip from the 1961 Dodge. The Custom 880 was well received by Dodge salesmen, who sold more than 17,000 of the new cars despite the late introduction. However, the Custom 880 sat ill with Chrysler dealers, who felt that Dodge was now encroaching on their turf. Chrysler’s sales revenues for the 1961 calendar year (which included the second half of the 1961 model year and the first few months of the calamitous 1962 cars) were even lower than 1959, but Townsend’s cuts and layoffs meant that Chrysler actually ended 1961 $11 million in the black. Although Tex Colbert had assured Virgil Exner that he would not be held responsible for the design of the 1962 Dodge and Plymouth, Chrysler’s board wanted someone held accountable for their failure and the man most responsible, Bill Newberg, was long gone. In November 1961, Lynn Townsend fired Exner — a bitter irony considering how strenuously Exner had protested the redesign program. Exner was allowed to remain in a nominal consultant role until his 55th birthday so that he could collect his Chrysler pension. He and his son launched their own design firm, Virgil M. Exner, Inc., in early 1962. In a further irony, Exner’s designs for the 1963 models proved to be very successful. His replacement, former Ford stylist Elwood P. Engel, made very few changes to Exner’s designs, which were popular enough to boost Dodge sales by 86% and Plymouth sales by 44% for 1963. 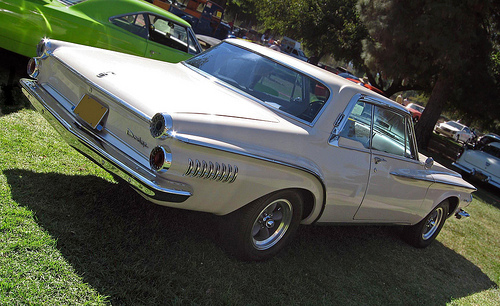 The 1963 Plymouth line retained the 116-inch (2,946mm) wheelbase of the ’62s, although they were 3 inches longer overall. The standard-size 1963 Dodge line was stretched to a 119-inch (3,023mm) wheelbase; the big 880 retained the 122-inch (3,099mm) wheelbase introduced the previous year. 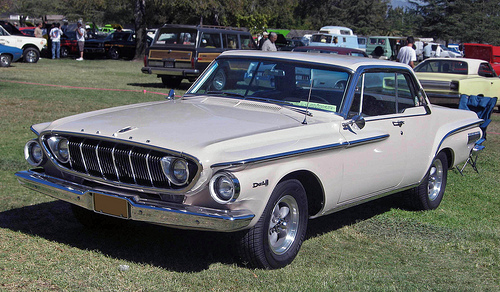 In 1965, Chrysler restored a restyled version of the short-wheelbase car (now known as the B-body) to the Dodge line, this time advertising it as the intermediate Dodge Coronet. Meanwhile, the ’65 Plymouth Fury was moved to the big corporate C-body. The Belvedere series remained on the shorter platform, now also rechristened a midsize rather than a full-size car. As a result, both divisions now had a full array of models in compact, intermediate, and standard sizes, putting both brands in a better competitive position. In the movie business, the commercial failure of a project will often cast a pall over similar projects for years to come. When Cutthroat Island tanked in 1995, for example, pirate movies were considered box office poison until the first Pirates of the Caribbean movie made a mint in 2003. Similarly, the failure of the 1962 Dodge and Plymouth was cited many times in the sixties and seventies as reasons Americans wouldn’t accept smaller cars, at least prior to the 1973 OPEC oil embargo. That conclusion, which remains the conventional wisdom in most automotive histories, doesn’t hold up to close scrutiny. The year before, Buick, Oldsmobile, and Pontiac had trimmed almost 5 inches (127 mm) from the overall length of their full-size cars, which had done their business no particular harm; their sales were down, but more as a result of a general economic slump that affected all automakers than anything else. In the 1962 model year, U.S. automakers sold around 2 million compact cars, accounting for almost a third of all domestic auto sales. AMC’s Rambler line — the largest of which was a full 12 inches (305 mm) shorter than the Dodge and Plymouth standards — outsold Plymouth five to four, to say nothing of the almost 200,000 Volkswagens sold stateside that year.) Clearly, the American public was not categorically opposed to the idea of smaller cars. The fundamental problem with the 1962 Dodge and Plymouth was not their size; it was that they were ugly and seemed like poor value next to their Chevrolet, Ford, and AMC competition. Even if Newberg’s assumption that Chevrolet was about to downsize had proven correct, his response would have been ill-advised. If Chrysler had created cohesive designs for downsized standard-size cars, it might have been a different story, but it’s hard to understand how anyone seriously expected that these cars would stand a chance against even an awkwardly downsized Chevrolet. The 1962 Dodge and Plymouth also suffered from the fact that Chrysler’s marketing made no great effort to educate buyers on the virtues of a smaller big car, such as ease of parking or the better gas mileage and performance made possible by the reduced curb weight. Instead, the company simply dumped these cars on the market as if they were business as usual, expecting their dealers and salespeople to sort it out. Worse, the board fired the only person who had been brave enough to point out the holes in the plot. The arrival of Lynn Townsend proved to be a mixed blessing. Townsend, who made the cover of TIME in December 1962 for his role in Chrysler’s recovery, managed to restore the company to profitability despite the dismal sales, but only at the cost of thousands of jobs. By most accounts, Townsend was a better accountant than a manager and his regime brought about a deep-seated conservatism that did Chrysler no favors in the years to come. Other than the revival of the Hemi engine and a few stand-outs like the 1968-1970 Dodge Charger, the Townsend era was marked by a general stagnation in engineering, styling, and product planning. By 1969, the stage had been set for Chrysler’s late-seventies near-death experience. A few generous souls have called the 1962 Dodge and Plymouth the right cars at the wrong time. We would call them a missed opportunity — a blunder whose consequences reverberated throughout the American industry for decades to come. Our sources for this article included the Auto Editors of Consumer Guide, “1962-1964 Dodge Polara 500,” HowStuffWorks.com, 9 October 2007, auto.howstuffworks. com/ 1962-1964-dodge-polara-5002.htm, accessed 11 January 2009; “1962-1964 Dodge 880,” HowStuffWorks.com, 23 August 2007, autos.howstuffworks. com/ 1962-1964-dodge-880.htm, accessed 9 January 2009; and Encyclopedia of American Cars: Over 65 Years of Automotive History (Lincolnwood, IL: Publications International, 1996); “Car Life Road Test: Dodge Custom 880,” Car Life Vol. 9, No. 6 (July 1962), pp. 46-49; “Chrysler Fights Back,” TIME 19 January 1962, www.time. com, accessed 10 January 2009; “Chrysler’s Troubles (Contd. ),” TIME 3 February 1961, www.time. com, accessed 10 January 2009; David R. Crippen, “The Reminiscences of Virgil Max Exner Jr.,” Automotive Design Oral History Project, 3 August 1989, Accession 1673, Benson Ford Research Center, www.autolife.umd.umich. edu/Design/ Exner_interview.htm, accessed 10 January 2009; James M. Flammang and the Auto Editors of Consumer Guide, Chrysler Chronicle: An Illustrated History of Chrysler – DeSoto – Dodge – Eagle – Imperial – Jeep – Plymouth (Lincolnwood, IL: Publications International Ltd., 1998); Milt Freudenheim, “Lester Lum Colbert, 90, Chief at Chrysler During the 1950’s,” The New York Times 19 September 1995, www.nytimes. com, accessed 11 January 2009; John Gunnell, ed., Standard Catalog of American Cars 1946-1975, Rev. 4th Edition (Iola, WI: Krause Publications, 2002); Ed Hoyt, Bill Newberg obituary, Skagit River Journal, 12 Dec. 2003, www.stumpranchonline. com/skagitjournal/, accessed 21 April 2015; Charles K. Hyde, Riding the Roller Coaster: A History of the Chrysler Corporation (Great Lakes Books) (Chicago, IL: Wayne State University Press, 2003); Joseph Kraft, “The Downsizing Decision,” The New Yorker 5 May 1980, www.newyorker. com, accessed 15 June 2015; Michael Lamm and Dave Holls, A Century of Automotive Style: 100 Years of American Car Design (Stockton, CA: Lamm-Morada Publishing Co. Inc., 1997), pp. 151-171; “Middle-Sized Gamble,” TIME 15 September 1961, www.time. com, accessed 11 January 2009; “Payola at Chrysler,” TIME 1 August 1960, www.time. com, accessed 9 January 2009; “Payola at Chrysler (Contd. ),” TIME 22 August 1960, www.time. com, accessed 9 January 2009; “Newberg Attacks Chrysler,” TIME 27 January 1961, www.time. com, accessed 9 January 2009; Melody Petersen, “Lynn Townsend, Ex-Chrysler Chief, Dies at 81,” New York Times 22 August 2000, www.nytimes. com, accessed 11 January 2009; Curtis Redgap, “Chrysler Corporation R Bodies: 1979-1989 Downsized, Full-Sized Cars,” Allpar, 2008, www.allpar. com, accessed 11 January 2009, and “Insider’s History of Plymouth,” Allpar, n.d., www.allpar. com, accessed 9 January 2009; “The Battle at Chrysler,” TIME 2 May 1960, www.time. com, accessed 9 January 2009; “The Man on the Cover: Lynn Townsend & Chrysler’s Comeback,” Time 28 December 1962, www.time. com, accessed 11 January 2009; “Time Clock: Feb. 17, 1961,” TIME 17 February 1961, www.time. com, accessed 11 January 2009; Jim Wright, “Plymouth Sport Fury,” Motor Trend April 1962, reprinted in Plymouth Fury Limited Edition Extra 1956-1976, ed. R.M. Clarke (Cobham, England: Brooklands Books Ltd., ca. 2002), pp. 46-51; Richard A. Wright, “Chapter 13 – Dinosaur slayer falters; car guys vs. money men,” A Brief History of The First 100 Years of the Automobile Industry in the United States, The Auto Channel, 1996, www.theautochannel. com, accessed 11 January 2009; David Zatz, Lanny Knutson, and Dave Stern, “Chrysler Corporation 1962: The right cars for the wrong time,” Allpar, 2006, www.allpar. com, accessed 9 January 2009; and David Zatz and Bill Watson, “The Early (Big) 1960-1962 Dodge Darts,” Allpar, n.d., www.allpar. com, accessed 10 January 2009. Many a thesaurus has been worn out searching for adequate prose to describe the hideousness of the 62s. It’s amazing how one (you, actually) can connect the dots from late 50s Detroit country club social scenes to the 1979 Bailout. The Plymouth, which isn’t [i]as[/i] bad, looks like a Chevy that’s been punched in the face very, very hard. The Dart…the Dart reminds me of an old underground comix character called Wonder Warthog. I’m surprised no one has yet taken me to task for my dour summary of Lynn Townsend. I know a lot of Chrysler fans idolize him for having greenlighted the Hemi, but a lot of Chrysler’s plight in the seventies (which led to the bailout) was attributable to his conservatism. I actually like a lot of Chrysler styling of the Engel era, which has a no-nonsense ruggedness I appreciate, but then, I appear to be the only one who doesn’t like the late-sixties GM A-bodies. At the time, though, most of Chrysler’s designs looked like very stale bread instead. To me, the front of the ’62 Dodge really looks like the gaping maw of an Anime squid monster. Beware of tentacles. That said, I’m a much bigger fan of the early-to-mid 60s bodystyles that were considered stodgy or boring at the time. The 64-65 Falcon, Pre-67 Chevies, and more rectilinear Mopars are my favorites. The move to more curvy lines in the late 60s/early 70s came with quite a bit of bloat and less inspiring detail work. I’m still on the hunt for something that mixes the more daring design details (dashboards and logos) of the late 50s/early 60s with the (incrementally) improved engines/transmissions/suspensions of the late 60s/early 70s. Interesting article. I was very small when these cars appeared, and let me tell you, they were not any handsomer when the grille is at your eye level! I hated them even then. The Monaco shrank in ’75 along with the Fury (the Gran Fury and Royal Monaco continuing as full-sizers). Then the whole family, including the Chrysler Newport and New Yorker, went down to the intermediate chassis in ’79. The ’75s are an arguable point — Chrysler didn’t really downsize, so much as they shuffled their nameplates around in a rather confusing fashion. By contrast, when GM downsized the B-body cars in ’77, they actually redesigned it, with significant differences in packaging, leaving them nearly the same size as the A-bodies (which weren’t downsized until a year later). If Chevrolet had just transferred the Impala and Caprice nameplates to the A-body and renamed the existing B-body “Grand Impala” or “Caprice Brobdingnag,” I wouldn’t really call that downsizing, either. You’re right about the 1982 note; I’ll fix that. “…all ’63 Dodges were moved to the 119-inch (3,023-mm) wheelbase of the Custom 880…” I believe the Custom 880 was on the 122″ Chrysler Newport wheelbase, and that the 119″ wheelbase was new. There’s still seems to be some confusion about the late ’70s. 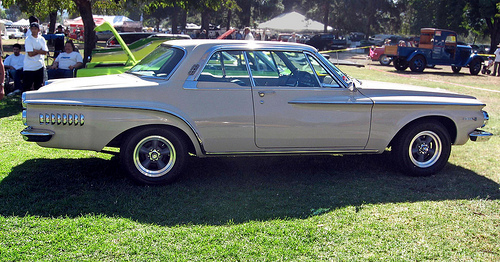 For 1975 the Plymouth B-body intermediate took the Fury name, with the full-size C bodies renamed Gran Fury. For 1977, Dodge did likewise, with the Monaco name moved to the intermediate and all the full-sizers taking the Royal Monaco name. The C-body Dodge and Plymouth were dropped after 1977, leaving only the B-bodies in 1978. These were then dropped for 1979, with Dodge getting the new R-body St. Regis, and Plymouth nothing until the reintroduced 1980 Gran Fury, essentially a rebadged Chrysler Newport. Thanks for catching the error on the Dodge line; you’re quite correct. I didn’t do a good job of sorting out the details of Chrysler’s seventies nameplate shuffle when this article was originally written, and a couple of minor revisions haven’t helped. Since I talk about that period more in the article on the C-body Plymouth and VIP, I decided to trim the conclusion of this article to avoid that confusion. I just can’t read often enough about this debacle. Corporate malfeasance and incompetence is of particular interest to me but what goes on today makes this particular Chrysler ordeal seem relatively benign by comparison. If you can manage to overlook the collateral damage of lost jobs, truncated careers, broken friendships, broken marriages, ruined lives there is a lot of absurdity and very dark humor to all of this. I didn’t know about the Country Club confrontation between Colbert and Newburg. Colbert had $200,000 in negotiable bearer bonds in his office safe? That’s very interesting. I don’t think nostalgia is terribly useful but if Television or Hollywood were to do this story it might look like the show “Mad Men”. This travesty really resonates regarding human shortcomings, greed, jealousy, pride, betrayal, cowardice, fear and loathing. Very interesting article…I remember reading that, at one point during the 1962 model year, AMC outsold all of Chrysler! It should be mentioned that these downsized Dodges and Plymouths were actually very good cars. Chrysler’s drivetrains were top-notch at that time, and the chassis provided an excellent combination of ride and handling. Quality control was also vastly improved over previous years. The heavily facelifted 1963 and 1964 Plymouths and Dodges, which continued to receive detail improvements and were also well built, were, in some ways, better cars than their GM and Ford competition. I wouldn’t mind owning a 1963 Plymouth Sport Fury hardtop. If Chevy had built the 1963 or 1964 Plymouth, it would have been hailed as a huge step forward on the order of the 1977 Chevrolet. But Chrysler products simply didn’t have the market acceptance and reputation that their GM counterparts enjoyed at that time. I beg to differ that these cars handled well; my father would strongly object because he drove them when working for the US government, and said that they were engineered so poorly, that the car would weave in one direction as the car lifted off the suspension (like cresting a hill at speed) then the car would weave in the other direction once the suspension loaded again. To go straight, you had to time it right and turn the wheel one way then the other. Plus I can tell you that these cars handled so poorly because I was 5 or 6 when my father nearly died driving one. My father (who engineered a boat trailer from scratch a year or two after this – best riding and towing trailer I’ve ever encountered) said he’d heard these cars were “rushed into production” and thereby the engineering was also poorly done. I heard later that the down-sizing was not so much an upsizing of the Valiant (except for styling) but a down-sizing of what they’d already planned. Cutting chunks out of the wheelbase obviously upset the ackermann effect of the steering and steering geometry. I have to wonder whether it was fixed by 1963 or if it was 1964 when these cars were reskinned, that it was fixed? I’ve also wondered why American Motors didn’t offer to simply buy Chrysler up right then in 1962, hire back some talent, clean out the boardroom (of Chrysler), and change history. Rambler, Plymouth, Dodge, Chrysler, Imperial and Dodge Truck (plus Fargo Truck in Canada) would have been a formidable competitor to Ford, if not GM, and could have accomplished a lot of good had it happened. Assuming of course, that George Romney would have stayed at the helm instead of going off to be the Governor of Michigan, that is. Six of one — from a styling perspective, it was a downsizing of the previously planned and approved designs. From a structural standpoint, the ’62 Dodge and Plymouth have a good deal more in common with the Valiant/Lancer than with the ’61 big cars. Even at the height of AMC’s success, I’m not at all sure that they would have had anything close to that kind of money. Despite its losses, Chrysler in that period was a huge company, and would not have been cheap. I guess if I were Romney, I would have left for politics at that point, while I was riding high, rather than waiting to see how a big gamble like that turned out. If the original styling proposed by Virgil Exner had been adopted at full size, especially for the Plymouth, the cars would have again, blasted ahead of GM and Ford in innovation. The shrunken models that were released, are still some of the most innovative designs to ever come out of Detroit. In regard to handling, my experience with Chrysler products started with a 1968 Fury and extended thru the full and midsized cars up to the final big car I had, a 1980 Plymouth Fury and a midsized 1982 era Diplomat/Aspen. Except for the 1980 Fury, they all handled fine on curves but were abymal at tracking straight ahead. You could not take your eyes off the road for a second with the Chrysler cars of the late 60’s to early 80’s without raising running off the road or into head on traffic. The only exception was the 1980 Fury, which while dull to look at, was probably the best full sized car ever made by Chrysler (and perhaps any maker) for the general time period of 1950 thru the 90’s. The only issue at all was their lean burn system. I had to give up my beloved 80 Fury police car back to the shop at 100K because they could no longer figure out how to make it run without throwing thousands of dollars worth of carb and computerish parts at it and it was only worth about $900 at auction. Precisely because it’s so “ugly” and different, I really enjoy driving my 62 RHD 4dr Dart (badged here in Australia as Phoenix, one of 400 built in Adelaide, South Australia) which garners plenty of interest because it’s so rare (and Ugly!) here! It’s lowered, has a 360+, disc-br front end (from a ’65 AP5 Valiant! ),bucket front seats and various suspension modifications to make it handle better. The previous owner re-badged it as a Dart, traveling to the States to get the bits. Despite all this, it looks original and turns heads. I enjoyed reading the history of the Chrysler Corp – in many ways it’s similar to the Studebaker decline/debacle (I have a ’63 Lark Cruiser, speaking of shortened cars!). I have just read your article on 1962 Dodge Phoenix and Dart. The web posting says 400 units assembled in Australia. I cannot find this reference in the article itself. I have a 1962 SD2 Phoenix with identification number 523. Can you tell me how many were built. I for one think that Chrysler was right to fire Exner. His designs from about 1959 on were very hit-and-miss. The 1960 Plymouth is downright nightmarish, the 61 Dodge’s inverted fins are bizarre, and the 61 Chrysler/DeSoto design is outdated compared to other Detroit offerings. Even the 59 Imperials look pretty silly (to be fair, so do the Lincolns and the Caddies for that vintage…) The first Valiant looks like a patchwork of five or six different designs assembled by a blind psychopath. As you remarked, why take the styling of the lowest brand to extend it to the pricier ranges? I think Exner, possibly due to his health issues, was out of it by then. His later designs, such as the Bugatti 101 roadster or the Stutz, are further proof, IMHO, that he had lost the plot (when your design is chiefly popular with Elvis and oil sheiks, it’s time to ask yourself some pretty searching questions!). Sure, he hated the downsized 62s, but having seen some clay models of what he thought the should have looked like, I reckon he deserved his pink slip. I agree, even though it may appear that Townsend “killed the Messenger”. The styling direction Exner was going in was in the wrong direction and changes needed to be made at Chrysler. It was time to clean house. It was the right decision. I think it’s important to keep in mind that the original reason Virgil Exner Sr. was hired (as discussed in the first part of the Chrysler Forward Look article) was that even K.T. Keller was getting nervous about everyone complaining that Chrysler styling was antiquated. Exner’s initial brief was to design swoopy-looking show cars so that people wouldn’t think Chrysler was perpetually fusty and the way he moved into production styling was convincing Keller and Colbert that they desperately needed livelier styling. So, Exner’s original mission was to explicitly to shake things up. That had previously worked, too — the ’57s really had put the fear of God into even GM and would have been an even more dramatic upset if they had been better built. It’s tempting to see the Valiant (which is an interesting but very odd-looking car) and the ’62s as an attempt to continue looking for new and radical themes in hopes of repeating that process. Unfortunately, even in their original conception, I don’t think they really gelled and they appeared at a time when the public was leaning pretty strongly towards tasteful and conservative. While I wouldn’t be quite as vituperative about it, I think the original Valiant is an interesting but not cohesive design. There are some aspects that are really nice and some that are just odd, and as a piece it’s kind of a mess. I do think I see what what Exner & co. were trying to do with the shape — approaching it a more sculptural way rather than just a big, blocky object with surface embellishments — and in that sense it was ahead of its time. However, that’s a more art critical assessment than an aesthetic one; my aesthetic judgment is that the design tries to do too many things at once and consequently succeeds at none of them. As originally planned, I don’t think the resemblance of the full-size cars to the Valiant and Lancer would have been quite as pronounced, though perhaps still more than buyers would have liked. The original designs, judging by photos I’ve seen of the clays, still looked very odd, so I would say the downsizing didn’t so much ruin as exacerbate them. Nonetheless, as mentioned, the ’63 cars, which were still mostly Exner, were much soberer and if a little quirky in spots were no longer especially offensive. So, in that light, it appears the planned ’62-’63 cars represented a trend of sort of backing away gently from the more fanciful late ’50s excesses. I saw a ’61 Chrysler earlier today and I still think it’s a good-looking car, although I will concede that it might have seemed more a product of 1959 than 1961. Awesome article. I have read far too many hacked up versions of this time at Chrysler, that misplaced Exner’s “plucked chickens” comment on the fin-less 1962 Chrysler models. Mainly because of their strong unpopularity, my Dad was able to buy a low mileage 1962 Dodge Dart 440 extremely cheap as a 2nd car. He was very impressed by its practical size, economy and performance. I like the looks of the cars, but admit the body sculpting features are proportionately to large for the car. You are not the only one that did not care for the late 60’s A-Body GM Cars. The rolling bland design with an awkward sloped back coupes. I owned the worst one the bird beaked 1969 Pontiac. Thank you for putting all the 1962 Dodge/Plymouth together in one article. Lately, I’ve come across many “want to be” auto journalists with blogs spewing fact and figures that are either completely wrong or totally out of context. They seem to be more concerned about a funny or humorist quip about the car or the people that designed them. It’s as if they all want to be “Top Gear” TV show hosts…..then, people read the article and then pass on the incorrect information and suddenly a new internet myth is created. Thank you for writing an excellent article on the 1962 and bringing all the tangential issues into proper context. This is one of the or the best articles I’ve ever read on this subject. It’s much appreciated. And thankfully, helps debunk some of the myths about these cars and the people behind them. My father, an old GM hand, had told me the story of how Chrysler’s 1962 redesign had almost killed the company (he described the cars as “ugly,” I actually like them). He also told me that GM was wary of trustbusters (you’ve mentioned this in other articles) and had secretly shoveled money to Chrysler to help keep the company afloat and keep GM from being broken up. Have you ever heard this story? Do you think there’s any truth to it at all? I have not. Obviously, it’s always hard to know exactly what kind of back channel stuff a big company may have done over the years, but I’m skeptical of the story. It’s definitely true that GM was afraid of being broke up by the Justice Department — I don’t know if Justice ever specifically contemplated that, but there were comparable forced divestitures that were upheld all the way to the Supreme Court — and consequently was nervous about the health of GM’s smaller competitors. However, I’ve never seen any serious evidence that such concern (which wasn’t universally shared within the corporation) ever translated into anything more than tacit assistance — the sort of thing that can be handled with a handshake or a quiet resolution to not pursue some action (or at least to not oppose something). The reason I’m skeptical about the story is that the amount of money that would be involved in propping up a company the size of Chrysler would be substantial, which would make it harder to achieve and harder still to keep quiet. Each GM division or department had a budget, of course, and I presume most of those budgets included some discretionary funds, but I would think something like giving several million dollars to a competitor would have to be approved by the board or a senior board-appointed committee. Aside from creating a paper trail, that would be where the trouble would start: A corporate board is supposed to be looking out for the interests of shareholders, and how are shareholders going to feel about the prospect of handing millions of dollars over to a struggling rival? Propping up Chrysler (or whomever else) wouldn’t guarantee the Justice Department wouldn’t still force GM to spin off Chevrolet or some other division and wouldn’t advance GM’s success in some meaningful way, and I’m sure some board members (and other stockholders) would have argued just that. Also, both GM and Chrysler were publicly traded companies at that point and when big companies exchange large amounts of money, there are a bunch of other interested parties (such as the IRS and SEC) that want to know where the money came from, where it’s going, what it’s for, and what conditions were attached. So, it would be a lot more complicated than slipping your out-of-work buddy $50 at lunch to pay his electric bill. To my knowledge, the closest GM ever came to something like this was in 1956. In 1956, when Studebaker-Packard was teetering, the Eisenhower administration tried (with the involvement of defense secretary Charles Wilson, a former GM officer) to get the big automakers to back a major loan for Studebaker-Packard, but GM didn’t go for it. I don’t know what kind of internal debate went along with that (my assumption would be that there would have been some supporters, but clearly not enough to sway the majority), but if GM didn’t want to help guarantee a loan for a competitor, why would they give another competitor an outright handout? As near I can recall; all ’62 “Dodges” were also branded “Darts” 330,440 etc. Not until Feb. when the 880 was introduced, did they offer a “full size” car, correct? Over on the oldcarbrochures website, they have a brochure for the ’62 Dodge and there are three series: Dart, Dart 330 and Dart 440 – in the various body styles. The back page shows Litho 7/61 so it’s an early print. So at least at the dealer level, they used the name Dart across the board and then used 330 and 440 for higher trims, tossing the names like Seneca and Pioneer. What a great story Aaron, well written and certainly fills in a lot of gaps, compiled from various sources that were disjointed. I own a 62 Dodge Phoenix 4 door in Australia. Currently mid rebuild, the history you have given us is excellent to provide the ‘feeling of why they did it’. I know that generations onward will read your comments and appreciate the work that you put into it. For me, I love the car as it is different…especially as I am installing a 2500Hp power plant. Again thank you. Disclaimer: I like quirky. Granted, the wart-hog grille on the Dodge was pretty bad, but nothing that a finer-textured (egg crate or honeycomb) grille with body-colored surround wouldn’t have fixed. I like the overall shape of the Dodge, but then I like the overall shape of the first-generation Valiant. I also like the fact that the outboard lights (both head- and tail-) are mounted lower than the inboard lights. I can’t think offhand of another car that had this. Of course, styling is subjective. It is remiss to avoid even the mention of Exner’s heart and stress problems. The downsizing work was done while Exner was convalescing; and the styling department was as adrift as the operations side after the Newburg/Colbert scandal. That’s not to say the final product would have been any different but it somewhat explains the leaderless acceptance of the GM downsizing rumors which might have otherwise been further investigated. You’re also leaving out the most important element regarding the “harder sell” for small cars in the North America vs. World; that is our comparatively low price for fuel. Other nations with motor industries through either outright “bans” on imports or through penalizing tariffs, have insured a viable domestic small-car market. Their specialization in such a segment ensured a competitive edge in the US market… At least when that market begins to demand fuel efficiency; motived by the family budget. However, please do not misconstrue these points as a criticism of the piece as a whole. Excellent and enjoyable accounting of the history. As mentioned in the text, while I unfortunately didn’t have permissions to use any of the surviving photos of the originally planned ’62s, I have seen a fair number of them and while they’re somewhat better-proportioned than the finished product, I’d be hard-pressed to say they would have been significantly less odd-looking. They were somewhat different, especially in detail, but quite odd, and that much was ultimately Exner’s responsibility just as the original Valiant was. I’ve talked elsewhere about why Americans, at least in the fifties and sixties, often seemed to like the idea of compact cars better than the reality — the Hudson Jet article discusses this at some length. Aside from cheaper fuel, a big factor is that the U.S. generally has not had vehicle taxes based on size or engine capacity, at least not to a degree that would incentivize buyers to buy a different car, as has generally been the case in countries like Japan or France. American buyers therefore expected that compact cars would be cheap and tended to be annoyed that they weren’t ENOUGH cheaper than bigger ones. I find the 1962 Plymouth, as originally planned by Exner, to be a handsome car, particularly the Super Sport version. The planned 1962 Dodge is only visible from the side in the photos I’ve seen. It looks better proportioned – the curved side glass, wider stance, deeper windshield and bigger bumpers were critical to the overall design – but the question is whether the front was changed for the final production version. That is the deal-breaker for the Dodge. The rear quarter panel and roofline of the 1962 Plymouth Fury hardtop coupe looks a great deal like the one used on the 1965-66 full-size Chevrolet. The greenhouse of a Dodge hardtop sedan looks a lot like the greenhouse used on the 1971-74 GM B-body hardtop sedans! These cars were ahead of their time – perhaps too far ahead for the average buyer? The problems start with the planned 1962 Chrysler and DeSoto, in my opinion. Both look quite odd, particularly in the front. The rounded, short deck lid on the proposed DeSoto sedan and convertible styling models would have also been a tough sell against contemporary Buicks and Oldsmobiles, which featured wide, flat and LONG deck lids. I’m guessing that the Plymouth would have sold better if it had been released as Exner originally envisioned it. The Dodge is a question mark (I need to see the front of the original styling models), but the Chrysler and DeSoto would have most likely flopped. I think by that point the DeSoto line would likely have expired anyway, for reasons unrelated to size or styling. Chrysler just wasn’t able to find a sustainable niche for an additional mid-price brand. I’ve read this fantastic account several times, but only now noticed one small error. George Love was indeed the Chairman of Consolidation Coal (now Consol Energy) but it was and is headquartered outside Pittsburgh. As for the cars, I’ve come to actually like the ’62 Plymouth with all it’s faults. It’s relatively clean and the interior is particularly appealing. I don’t know anyone with a sane mind who could really like the Dodge. The real underappreciated cars of this final era, in my opinion, are the ’63 Chrysler and Valiant. (I’m not a big fan of the squaring up Engel did to the ’64 versions of either.) The Chrysler, to me, is the purest example of where Exner was headed with his ’62s, and the Valiant is shows where the ’62 Plymouth could have gone. 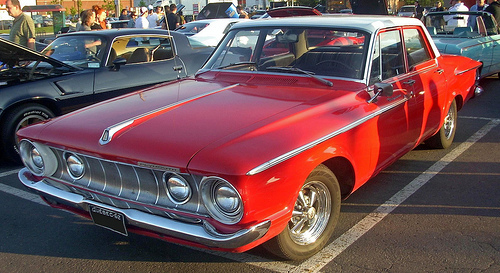 The ’63 Plymouth isn’t bad, and I have fond memories of the Fury sedan my dad had until 1970. My family ran a Chrysler-Plymouth dealership from 1933 to 1967, and I can confirm the ’62 was a hard sell, especially in a Pittsburgh steel town where less metal wasn’t what anyone was looking for! Thanks for the correction about Consolidation Coal! I’ve amended the text. The ’63s are designs that, in my subjective view, look pretty good in isolation and in comparison to their immediate predecessors, but a bit fusty if compared with the better contemporary designs (such as the Pontiac Grand Prix or the new Buick Riviera). The funny thing to me is that while Exner’s earlier designs had a lot of Italian flavor, the ’63s look like some contemporary English cars — the Ford Zephyr/Zodiac, in particular.